In his follow-up to the Evil Dead (aka the quintessential film school horror movie), Sam Raimi and his immensely resourceful crew approach basically the same premise (Bruce Campbell & co. holed up in a cabin vs. zombies and assorted supernatural bullies) with ten times the budget. As a result the shock effects are more audacious and less crudely executed, though without losing the punky, do-it-yourself spirit of the original. At the same time, the possibly unintentional campiness of the first installment is now presented outright as a point of departure for a frontal assault on the line demarcating comedy and horror. Critical to the formula is sheer overabundance: an exhausting array of round-the-corner scare tactics shot from every angle; ample moments of explosive physical comedy eliciting hysterical reactions to death and dismemberment; gallons of blood poured, squirted and splattered across the screen; and Campbell's exaggerated reactions to all of the above. All of this is done to whiplash pacing fueled by the prodigious ingenuity of the creators' perversions. The film itself plays like a blenderized cocktail of Three Stooges, Tex Avery, George Romero, Dario Argento (the film's climax references Wizard of Oz, Jaws, Raiders of the Lost Ark and Return of the Jedi), but in turn its visceral effects have left their traces in Johnnie To's Heroic Trio to Darren Aronofsky's Requiem for a Dream, and many many films in between and since. Deadites Online: The Fan's Official Source for Evil Dead has a page full of interesting facts, such as: "The color of the deadite blood was changed from red to shades of green, yellow and black to help the movie pass the censorship board without major cuts. " The film was still released unrated to avoid an X rating from the MPAA. The idea for an Evil Dead sequel was on the mind of Sam Raimi even as he filmed the original one. His follow-up film would feature Ash as he traveled back in time to defeat an entire army of cursed Deadites. But this epic scale story would demand a significantly larger budget and that was something that his associates at Embassy Pictures just didn’t have at their disposal. And so as Raimi and his creative partners Rob Tapert and Bruce Campbell patiently waited for financing to come through, they started interviewing potential cast and crew for their upcoming film. One of the candidates that they had interviewed was about to go to work on Stephen King’s first filmmaking experience, Maximum Overdrive. In a conversation with King, the crew member relayed the difficulties that Raimi and company were having trying to get Evil Dead 2 off the ground. King passed this information on to his producer, Dino De Laurentiis, who in turn offered Raimi help financing a sequel. But De Laurentiis was not interested in the story of Ash in the fourteenth century. Instead he wanted to virtually recreate the first film; the cabin, the woods, and all. Evil Dead II would not officially be a remake, but when the eagerly anticipated sequel went into production that’s basically what they had (the rejected story would, of course, become Army of Darkness a few years down the road). According to the site, the film's total budget was $3.5 million and theatrical gross was $5 million. "Its theatrical run was brief, but like its predecessor, it eventually found its market on home video." There are several sites that have posted the script of the film. Seventh draft here and here. Matt Caracappa of Underground Online provides a lengthy synopsis as well as paragraph descriptions of each character. Particularly good is the description of Jake: "Why do we give Jake such a hard time? How 'bout the fact that he has a thinning mullet, wears what appears to be a Members Only jacket and takes part in sucker-punching our hero. Sure, we've all been there at some point in our life, but he gets possessed awful easy and eats a lock of Bobbie Joe's hair. What a chump. He does, however, make for great axe fodder." The "Official Bruce Campbell Sound Library" has several downloadable audio clips of memorable Bruce Campbell as "Ash" lines. It’s true that the horror-comedy was by no means a new concept when Evil Dead II had its theatrical release in 1987. Touches of humor graced the classic films of James Whale, Abbott and Costello met Frankenstein (plus Dracula and the Wolf Man) in the ’40s, and An American Werewolf in London had given us a distinctively uneasy mix of terror and laughs. What distinguishes Evil Dead II is that it isn’t a horror film with comic moments or a comedy with frightening moments. It is instead a true horror-comedy that taps into the fact that both comedy and horror rely on weirdness, incongruity, and shock. Something catches us off guard, and we laugh or we scream. Sam Raimi is a well respected dramatic and action director nowadays, but at the time he was a fledgling horror auteur. The odd thing is that his main inspiration was the film work of The Three Stooges, so his 'horror' films were chock full of slapstick humor as a result. His camerawork was revolutionary, and the sheer off-the-deep-end brilliance of this film's look is part of what hooked me on it. The most famous of Raimi's gimmicks is the Sam-O-Cam, a demonic POV shot resulted from strapping a camera onto a plank of wood and having two people at either end run around the woods with it. Coupled with an odd, demonic groaning sound effect, the result is fabulous. I'm not suggesting that "Evil Dead 2" is fun merely because you can spot the references to other movies. It is because (a) the violence and gore are carried to such an extreme that they stop being disgusting and become surrealistic; (b) the movie's timing aims for comedy, not shocks, and (c) the grubby, low-budget intensity of the film gives it a lovable quality that high-tech movies wouldn't have. The real trick of Evil Dead II is not just the scares and the gags. It's the pure kinetic energy. It moves with a vicious speed not seen since Howard Hawks' His Girl Friday (1940). It powers through its 83 minutes like it was a short cartoon. Yet it's never overwhelming. Director Raimi instinctively knows when--and for how long--to give us a breather. What really makes this film though, is the incredible, over the top, thoroughly manic acting performance from Bruce Campbell. 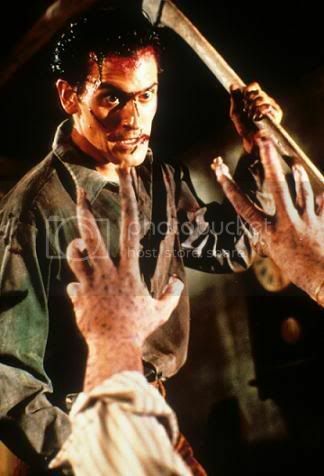 The character of Ash is a great invention and is developed further in the third Evil Dead film (Army of Darkness), although in both it is Bruce who brings the character to life. His delivery of some quality one-liners is excellent but the most incredible thing is his unbelievable facial expressions, the scene where he is going mad and laughing with the house always reduces me to hysterics. I like the idea as well, the thought that your brain may descend into madness in order to ensure your survival. Sam Raimi's 1987 sequel to his furiously kinetic 1983 horror, with resurrected demons battling the usual assortment of human incompetents. The effects are just as delirious this time around, but the nightmare poetry has vanished, along with the sense of archetypal purpose and narrative inevitability that held the jack-in-the-box original together. Everything's so show-offy and literal that nothing really matters beyond the self-conscious display of technique: it's like a chopping-block adaptation of Edison's old Dream of a Rarebit Fiend, without the excuse of primitive experiment to justify the arbitrary flailing about. The pop-up humor and smirkiness suggest Raimi's aspiring to the fashionable company of the brothers Coen, though on the basis of this strained effort I'd say he's overshot the mark. Evil Dead 2 is the living end of the eighties trend toward horror comedy, a film so drunk on its own bloodlust that crosses the border into broad farce early on, never to return. As such, parts of Evil Dead 2 are awfully funny. After Ash cuts off his own possessed hand and traps it under a pail, Raimi provides one of the cinema's worst puns when Ash weights the pail with a copy of A Farewell to Arms, for instance. And when Ash converts a chainsaw to substitute for his missing appendage later in the movie, he declares the result "Groovy". This line traditionally gets howls from the audience. There is a fairly widespread critical consensus that Evil Dead 2 is better than its predecessor. I personally don't share that view. A large part of my sentiments towards the film are shaped by my resentment of the horror comedies of the era--I go to horror movies for horror, not comedy. 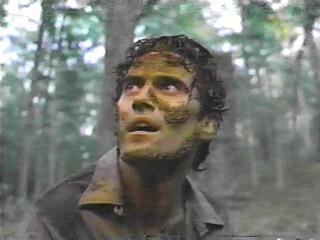 Oh, don't get me wrong: Evil Dead 2 is a fun movie, all right, but The Evil Dead (the first one) is SCARY. Given a choice, I prefer scary to fun any day. The vaunted HD-sourced, 1.85:1 anamorphic widescreen presentation is, indeed, pun intended, eye-popping. It reduces the minimal flaws--slight motion-blurring, occasionally splotchy shadow detail, and unobtrusive edge-enhancement--of Anchor Bay's previous transfer while simultaneously pumping up the film's mid-eighties palette to a pleasing level of saturation. Look at the green glass of the lamp lighting the reel-to-reel recorder in the film's opening minutes--and fall to pieces. DD 2.0 audio is provided along with a DD 5.1 remix, the latter the preferred option as an astonishing degree of care was obviously expended to fill the discrete channels with all manner of obscenity. God bless America. Meanwhile, the classic commentary track featuring Campbell, Raimi, co-writer Scott Spiegel, and makeup artist Greg Nicotero--the only real major roommate on this dual-layered disc now that the full-frame version of the flick's been jettisoned--resurfaces; if you're unfamiliar with this track, it's one of the few must-listens of the yakker era--not for its information (which is pretty good, actually), but for the camaraderie and off-the-cuff wit of those involved. Indeed, the DVD commentary track featuring Campbell, Raimi et al is one of the most entertaining as well as informative commentaries I've heard. Mutant Reviewers from Hell goes so far as to offer quotes by Bruce Campbell from the DVD commentary track!